It is said that the Pollera arrived in Panama during the time of Spanish conquest. The dress that came from the Gypsy dress worn in the South of Spain, and was originally made from a heavy cloth. However, the warm of the tropical climate of Panama caused the dress to be adapted to be made from a lighter fabric. This Spanish house dress eventually grew highly intricate with lace detailing, hoops and embroidery becoming one of Latin American's most adorned costumes. Today the Pollera is a luxury dress. Some polleras come with a high price tag. The loose blouse that hangs off-the-shoulders, accompanied with a wide A-line ruffled skirt can cost up to $10,000. The embroidery on a pollera can take years. The jewelry and headdresses that accompany the pollera can cost a pretty penny as well, depending on how much gold they include. The best place to take in the beauty of this Panamanian tradition is at the Mil Polleras Festival which takes place at the beginning of January. 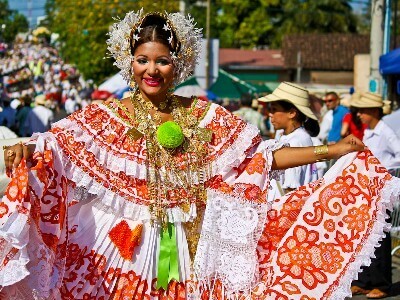 Each year over 10,000 women dresses in pollers are paraded through the town of Las Tablas in Los Santos, Panama. They are accompanied by brass and accordion bands that dance through the streets of the town. The festival includes people of all ages, from young to old. Visitors and locals dance through the street with the bands and women, taking in Panamanian dances, music and food. Barbecue stands are set up along the streets where people can stop in for a bite to eat. The Mil Polleras Festival is a true insight into Panamanian culture and the pollera tradition.